But you can also destroy a diet with certain sauces, so make sure you choose the right ones! When choosing condiments, I’d suggest reading labels, choosing options that are lower in sugar and as natural as possible. And don’t be afraid to step outside of your usual grocery aisle and venture beyond the familiar condiments, such as mayonnaise and ketchup. Here are five healthy condiments you can add to your meals to help you stay on track and achieve your fitness goals. Tahini: This is a staple in Middle Eastern dishes made of ground sesame seeds often combined with lemon and other spices. It packs a major flavor punch, is a healthy fat, and contains B vitamins and calcium. 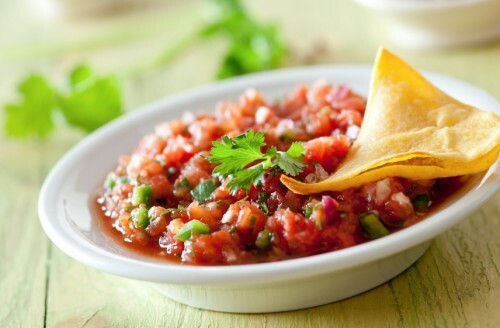 Salsa: This is an excellent low-calorie condiment that has lots of vegetables and an intense flavor. Opt for brands that are natural and lower in sodium when possible. Mustard: If you’re watching calories, mustard is one of the best options for you. Most mustards range between 0-15 calories per serving, depending on what they’re flavored with. And they’re packed with healthy benefits, such as antioxidants and anti-inflammatory compounds. Sriracha: This is my favorite healthy condiment because it is very low in calories and adds major sass to any dish, especially if you love spicy food! Tamari sauce: This popular Asian sauce tastes similar to soy sauce but is a great gluten-free option and doesn’t have as much sodium. Tamari can be used in a variety of dishes and is excellent addition in a stir-fry or as a dip for vegetables.